My husband and I recently had the pleasure of meeting Hilarie and Scott at a country inn in Upstate NY. There was an instant connection. You see, her dad died suddenly and left a gaping hole in her heart. It changed her and her family. I know from my own personal experience that grief does that. And, sometimes (if we let it), it can transform us. You see, heartache transformed my family and me. We found a way through our struggle by starting Ophelia’s Place. 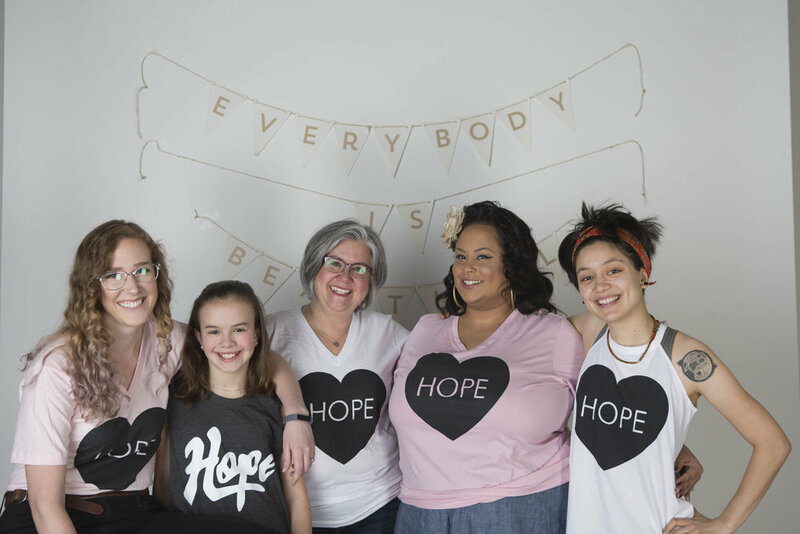 Hilarie found a way through hers by discovering her “happy,” which came in the creation of a lifestyle brand that helps people live in the moment and enjoy life. Right. Where. They. Are. Hilarie and Scott inspire me for finding their joy and not giving up. They inspire me with their whole truths… that the journey is simultaneously redemptive and tremendously exhausting. I saw myself in their story. In the blood, sweat and tears that go into the belief that we were meant to do something, which also comes with the back-breaking, soul-filling work of making it happen. Ophelia’s Place “lifestyle brand” came in the form of our Circles of Change product line. It’s our “happy,” as well as our prevention, our healing, our recovery and our sustainability. It’s the acknowledgement of the struggle and the hope for the healing. It’s the joy that we experience… yes, the joy, even in the midst of the struggle. Hilarie and I talked late into the evening and shared our trials of running a cause-oriented business. A business that values people over profit; a business that seeks to do good in our little corners of the world. She talked about making her business a non-profit. I told her I didn’t know if we needed more non-profits, but I did know we needed for-profits that care about this beautiful, fragile world we live in. As the night came to an end, we knew we would be forever friends, even if we never see each other again. It binds us in ways only our hearts can understand. When I wear the sweet bracelet she gifted me that evening, I reconnect with that joy — that feeling of delight. That’s something what we want everyone to experience through our Circles of Change products as well. Hilarie and I were united by a purpose greater than us and that kind of connection is unbreakable. Carter Chambers, The Bucket List. Thank you Hilarie and Scott for your continued determination to bring joy, love, and happy to the world.